"The offspring of an Atlantean princess and an American explorer, the powerful mutant Namor is a force to behold. While he occasionally leaves his kingdom to work with - or fight against - the surface world, the welfare of Atlantis is always his utmost priority." 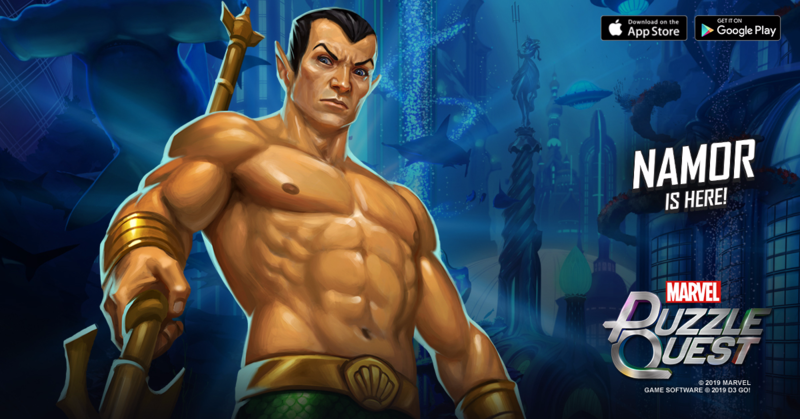 Check out the brand new 4-Star Namor, and find out how you can recruit him onto your roster! Prince Namor strikes down his foe but bestows upon them a boon, for his mercy knows no bounds. Deal 1479 damage and destroy 3 AP in the enemy's strongest color. Then the enemy team gains 1 Black AP. The Sub-Mariner uses ancient Atlantean technology to unleash a tidal wave upon the surface world. Convert 3 basic tiles to Blue. If there are 10 or more Blue tiles remaining after any matches are made, deal 1100 damage to the enemy team. Rewards tokens to Venom Bomb, random cover of Namor, and more!